For many, the two most important sources of retirement income are Social Security benefits and distributions from retirement accounts, including required minimum distributions after age 70 ½. But these two present a tax challenges. The rules for calculating taxes on distributions from retirement plans are not the same as those for taxing Social Security. 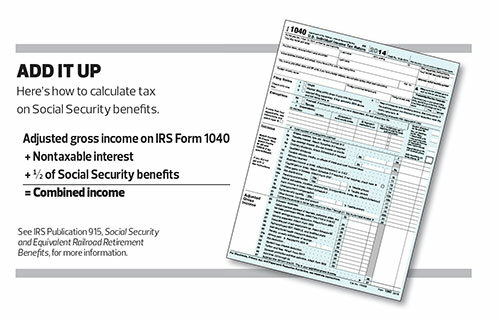 Withdrawals from employer retirement plans and IRAs are taxed as ordinary income, but Social Security benefits may or may not be taxable, depending on a few factors. Advisor’s must help their clients create a plan that will optimize both income sources in terms of benefits and taxes. Under the tax code, there are special rules for calculating the taxation of Social Security benefits. No one ever pays taxes on more than 85% of their benefits. This means 15% is tax-free for everyone. However, these tax rules do not apply to distributions from retirement plans. The amount of your clients’ Social Security benefits that are subject to income tax depends on the total amount of combined, or provisional, income they have. The formula for calculating this can be a bit confusing; see the “Add It Up” graphic. Note that adjusted gross income includes wages, self-employment income, dividends and interest, capital gains, pension payments and rental income, among other items. If a client is single and has a combined income between $25,000 and $34,000, up to 50% of the Social Security benefits are subject to tax. If the combined income is more than $34,000, up to 85% of Social Security benefits are subject to tax. If clients are married filing jointly, they may have to pay taxes on 50% of Social Security benefits if their combined income is between $32,000 and $44,000. And if their combined income is more than $44,000, up to 85% of their Social Security benefits are subject to tax. Unlike many thresholds in the tax code, these amounts are not indexed for inflation. RMDs and other distributions from retirement plans add a layer of complexity to the taxation of Social Security benefits. When calculating combined income for the taxation of Social Security income, you must include distributions from retirement plans, including RMDs from both IRAs and employer plans. RMDs can increase the taxation of Social Security because they raise the AGI and thus boost combined income. But, of course, clients should not stop taking RMDs to lower the taxation of their Social Security, because there is a 50% excess accumulation tax for not taking (or not taking enough of) an RMD. Clients should plan, however, for the potential impact RMDs may have on Social Security benefits. There are several planning strategies advisors should at least consider. One strategy that could make sense for clients is “spending down” IRAs in early retirement to delay claiming Social Security benefits. Delaying Social Security benefits can result in higher monthly payments for life (and, potentially, over the lifetime of a surviving spouse). Required minimum distributions will be smaller due to lower year-end balances. As a result, combined income may be lower, resulting in a smaller amount of Social Security benefits becoming taxable. By swapping out IRA income for Social Security benefits, a client may be able to have more spendable dollars due to the relative tax efficiencies of those benefits. There is no guarantee a client will live long enough to see the benefits of delaying Social Security payments. IRA assets remaining at a client’s death can be passed on to beneficiaries, but Social Security benefits generally die along with the client (or spouse). Another potential strategy to consider is converting IRAs and other pretax retirement account funds to Roth IRAs prior to taking Social Security benefits. Unlike supposedly tax-free municipal bond interest, tax-free distributions from Roth IRAs don’t increase combined income. Therefore, tax-free distributions from Roth IRAs can be taken without subjecting Social Security benefits to increased taxation. Roth IRAs have no required minimum distributions, so clients can supplement their other income (including Social Security benefits) with distributions from Roth IRAs as they please, without triggering taxation of Social Security benefits. There are, of course, some downsides to this approach as well. For one thing, it may be more tax efficient for a client to have more of their future Social Security benefits included in their income than it is for them to complete a Roth IRA conversion today. And, of course, there’s no guarantee that the rules for Roth IRAs today will be the same as when a client is eligible to claim Social Security benefits. If the Roth IRA conversion strategy is going to be used to minimize the taxation of Social Security benefits, it’s often best to do so before benefits are received. That’s because, when clients are receiving Social Security benefits, converting IRA or employer plan funds to a Roth IRA may increase the taxation of Social Security for the year of the conversion. On the other hand, affluent clients who have higher combined income from wages, interest, dividends and RMDs may already be paying tax on 85% of their Social Security benefits. A Roth IRA conversion won’t affect their Social Security, because the taxes they’ll owe on this income can’t increase. Of course, the Roth IRA conversion itself will add to their tax bill and could push them into a higher tax bracket. A recent tax court case illustrates the confusion over how the tax rules work for both Social Security benefits and RMDs, and how they can affect each other. In this case in question, Dennis J. McCarthy et. ux. v. Commissioner, Holly and Dennis McCarthy, a married couple, were both receiving Social Security benefits. Holly — a retired school nurse who participated in Ohio’s State Teachers Retirement System’s qualified retirement plan — was also taking distributions from that plan. No federal income taxes were withheld, in all likelihood because she chose to have zero withheld for taxes. The McCarthys then filed a joint federal income tax return for 2011 in which they reported only one-third ($9,233) of the retirement plan distribution, with the tax able amount as $8,945 ($9,233 – $288 basis = $8,945). Holly and Dennis also reported receiving Social Security benefits totaling $37,600 — an amount that, in truth, included some of Holly’s plan distribution — with a zero taxable amount on their tax return. In 2013, the IRS sent the couple a Notice of Deficiency for errors in their 2011 federal income tax return. The IRS claimed the McCarthys owed over $1,000 more in taxes, because they had failed to include over $18,000 of Holly’s plan distribution as income. The IRS also claimed that the couple should have included in income more than $3,800 of Dennis McCarthy’s Social Security benefits that year. The McCarthys disagreed with the IRS and took the issue to Tax Court, where they represented themselves. They were age 82 at the time. Unfortunately for the McCarthys, the court agreed with the IRS and ruled that the pair owed taxes as a result of their miscalculations with respect to both the retirement plan distributions and the Social Security benefits. The court noted that the McCarthys had mistakenly claimed some of the Ohio teachers plan distribution as Social Security benefits. The court also ruled that the couple miscalculated the taxable amount of Dennis McCarthy’s Social Security benefits. He received $19,132 in Social Security benefits and reported none of it as taxable for 2011. The McCarthys’ only argument was to ask the court to make an “equitable resolution” in this case. They obviously were confused, and argued that it was unfair that two agencies of the federal government tax their retirement distributions differently. The McCarthys are right that this is confusing. Even so, the court responded by saying that it must enforce the law as written and cannot change it to give them a break; only Congress can do that. No one wants to spend their retirement years fighting the IRS. Advisors must ensure that their clients avoid a fate similar to that of the McCarthys by helping them understand the often confusing rules of taxation for different income sources. NOW AVAILABLE for US Taxpayers in Secure Compliant TAX FREE Jurisdictions! Original article by Ed Slott, a CPA in Rockville Centre, N.Y., is a Financial Planning contributing writer and an IRA distribution expert, professional speaker and author of several books on IRAs. Follow him on Twitter at @theslottreport. This entry was posted in Americans, Education, Expats, Green Card Holders, IRS, Pensions, Retirement, Strategy, Tax, USD by Adrian Rowles. Bookmark the permalink.